Located just 4.5 miles from the Pacific Ocean, Wolff Vineyards leverages the cool ocean breeze with its southern Edna Valley climate to produce some of the most distinguished and enjoyable wines on the Central Coast. With 125 acres of ecologically friendly vines surrounding their beautiful tasting room property, the entire experience at Wolff is filled with family history, wine education, and an overall sense of genuine hospitality. Founded by Elke and Jean- Pierre Wolff, they have grown and expanded their business alongside their children Clint and Mark. These days, you will find the sons both running the tasting room as well as dealing with the grape growing and wine production. With a full menu of reds and whites at Wolff, it is hard to go wrong. They produce a range that includes Chardonnay, Riesling, Pinot Noir, Syrah, Petite Syrah, and Teroldego. The Teroldego grape is an Italian varietal that only gets a few hundred acres of growth in the entire United States, so make sure to give it a try when you head in to Wolff. Most recently, the vineyard took a slew of medals in the local wine competitions, including gold in the 2017 LA international Wine Competition for their Syrah, and gold in the 2017 Orange County Commercial Wine Competition for their Red Wolff Blend. With a number of other award-winning wines, quality is something you’ll never have to worry about when choosing a bottle of Wolff Wine. With the pristine location already noted, Wolff’s tasting room has a bevy of other great qualities to make your visit memorable. Their hospitality is top-notch; you’ll be pampered and educated all at once by a staff whose sole goal is to accommodate any size or style of group. Wolff has both indoor and outdoor seating, with a dog-friendly tasting room; they even have a couple pups of their own that usually make themselves available for petting during business hours! There is very little pretense from top to bottom in the Wolff organization, which is welcome in an industry that sometimes is uninviting to the inexperience taster. That being said, their educational standards are also sky high, making Wolff a prime destination to stop and learn while on an Edna Valley wine tour. To top off the rich family history, sublime property, and experiential tasting, the bottom line is strong: Wolff’s wine is award-winning, and a visit there will prove delightful. 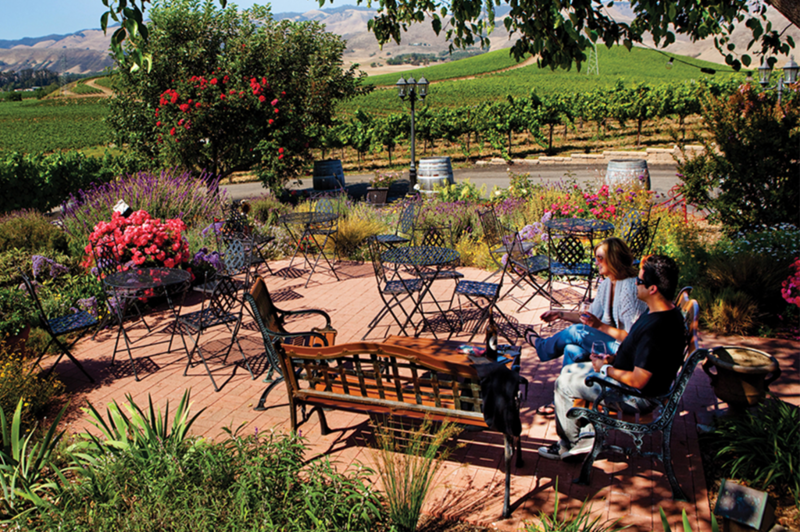 Thinking about a wine tour in Edna Valley? Read this quick guide to wine tasting etiquette on the Central Coast, and 5 Reasons Wine Wednesday is important!